Modern kitchen and bathrooms (one main, one en suite). Very well resourced, with hair dryers, baking equipment, toasted sandwich maker, electric blankets (in winter), bedside lamps, board games and books. Back and front deck, gas bbq, outdoor dining table and chairs. There are several heaters for those cold Waikato nights and an HRV system as well. There is a lovely firebox, and we try to keep a supply firewood there, but this is not guaranteed. Very close to a small group of shops/eateries. Ten minute walk to Waikato University and Hillcrest High school. Close to Ruakura Innovation Park. Easy drive to Mystery Creek. See below for special conditions. 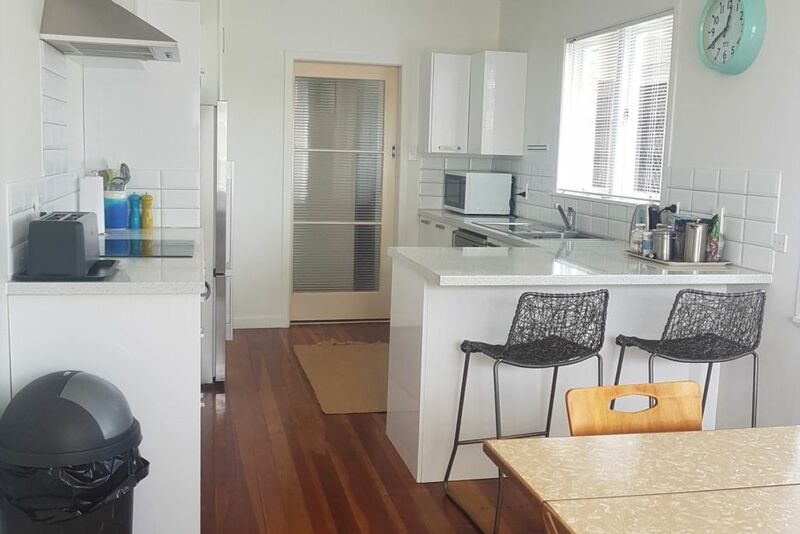 This great property will provide a fantastic base for a comfortable stay in Hamilton. As animal lovers we are happy to consider accommodating your pet. Any arrangement to bring a dog MUST be discussed with us prior to booking confirmation. We have a strict policy that no extra people are to stay who are not booked in. We have a strict policy of NO parties, however small BBQs/social gatherings are fine. Please no loud noise after 11.30pm. Silverdale House has a new Manager, Karen who will give you the same great management experience that previous guests have enjoyed. We are happy to be contacted about any special conditions or extra information you require. Short/medium term stay rate enquiries welcome. One carport plus offstreet parking available. Clean up your dogs pooh. Dogs not to be left at the property unattended for any length of time. Respect neighbours as far a dog barking is concerned. Meg and Nigel own this cute house. it is clean, spacious and well appointed. Our manager Karen takes pride in keeping the house clean to a high standard. She also ensures everything is in good working order. We have gone to lengths to avoid the stark 'motel room' atmosphere. This house feels more like a home with books and games, as well as nice artwork and tasteful decor. It is private, warm and spacious. Guest comfort and satisfaction is our priority, as well as to provide value for money. Great Field Days Accommodation. Close to the university. Shops/eateries within a two minute walk. This house is larger then most three bedroom properties. A Private fenced yard, with bbq and outdoor dining area. Everything in excellent working order. Guests notice and comment on the decor and cool arty touches. Two wall panel heaters, three other heaters. Quality electric blankets on all beds in cooler months. Quality cotton sheets provided. Quality flannelette cotton sheets provided in winter. Washing machine is great but not large. Laundromat across the road (two minutes walk) for washing of large items. Wood is stocked up most of the time. Please do check with owner, however to ensure wood is available for your stay. One carport. Room for offstreet parking for one and possibly two other cars. Ceramic cooktop and rangehood. Oven below. Light, airy and pristinely clean. Dining area next to kitchen. Highchair can be provided. Please ask manager. A basket of toys at the property. Please check this to ensure they are safe for very young children/babies. Nice deck front and back. Unfortunately, wheelchairs can not easily access this property. There are three steps on each of the front and back decks. Previous guests often comment that this property is better then they expect it to be. Our guests comfort and satisfaction is important to us. A comfortable, well fitted property on a busy road. The house is very comfortable with many retro touches. We were impressed with the way it was all put together. It is close to shops and food outlets and is on a main road so getting anywhere is a breeze. Sadly, the road is extremely noisy and the property is surrounded by closely packed housing and you can't choose the neighbours. It is a great place to stay if you've got things to do around Hamilton, but it's not exactly peaceful and relaxing. Good location, well stocked house. Good location with local services close by, 5 minutes from Hamilton Gardens and great connections to highways in all directions. We were impressed that the home had everything we needed and more. The instructions to get into the home were extremely clear. Wonderful guests. Left the house in excellent order. Recommended. The properties location suited our situation extremly well. The neighbours friendly dog although not a problem to us may be to other guests.